A UK court has rejected a bid to extradite Rwanda's spy chief to Spain to stand trial for his alleged role in massacres after the 1994 genocide. Karenzi Karake was on bail in the UK following his arrest in June on a warrant issued by Spain. His arrest strained diplomatic relations between the UK and Rwanda. A Spanish judge indicted Gen Karake in 2008 for alleged war crimes. The UK ruling has been welcomed by Rwanda's Justice Minister Johnston Busingye. Gen Karake had been the victim of "an unjust case", he said. Rwanda's Foreign Minister Louise Mushikiwabo said she was "delighted" that Gen Karake was returning to Rwanda. "This was an unnecessary and abusive process," she said in a tweet. For an extradition to be made following a European arrest warrant, the alleged offence must be against the law of both the prosecuting country, in this case Spain, and the country of arrest (UK). There is, however, a list of 32 offences for which dual criminality is not required. "Terrorism" is on that list but "war crimes" are not. It appears that Gen Karake's defence team successfully argued that he was facing war crimes charges in Spain, and so "dual criminality" did not apply. In addition, Gen Karake cannot be charged for war crimes committed in another country under UK law, as he can in Spain. This is because of Spain's particular laws relating to "universal jurisdiction", which allow Spanish courts to indict those it believes have carried out crimes against humanity, war crimes, genocide or torture. Rwanda's President Paul Kagame had strongly condemned Gen Karake's arrest, saying the UK was showing a "colonial" mentality. He was on an official visit to London when police arrested him. Spanish investigative judge Andreu Merelles had indicted Gen Karake, along with 39 other current or former high-ranking Rwandan military officials. He was accused of killing ethnic Hutu civilians in both Rwanda and Democratic Republic of Congo, after Mr Kagame's Rwandan Patriotic Front (RPF) came to power in 1994. There were angry scenes outside a London court after the ruling was made. Protesters threw water bottles towards Gen Karake and Rwanda's justice minster. Police formed a heavy cordon around Gen Karake, and escorted him away. The demonstrators were of Congolese origin, and targeted anyone who was Rwandan. They even attacked me when they saw on my BBC ID card that I had a Rwandan name. Some of the Rwandans outside court fled. The ruling is a huge victory for Rwanda's government. It will also help ease diplomatic tensions with the UK following the spy chief's arrest. The Tutsi-dominated RPF helped end the genocide, in which some 800,000 Tutsis and moderate Hutus were slaughtered by Hutu extremists. Gen Karake is also accused of ordering the killing in 1997 of three Spanish nationals working for a medical charity, Medicos del Mundo. 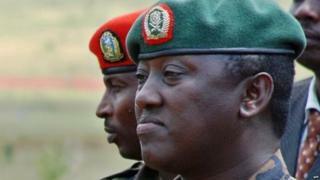 Rwanda has always maintained that Gen Karake was innocent, and the charges were politically motivated. His defence team included Cherie Booth, former UK Prime Minister Tony Blair's wife.